The Apple iPhone is one of the best-selling consumer electronics devices in history. The iPhone’s success is a result of its great technology paired with great design. In many ways, the slim and minimalist phone is more than just a communication device, it is also an artistic statement. So much thought went into the design and feel of the device that it seems a shame to have to rechage the iPhone with a cable. Cables are messy. They get tangled, they’re either too short or too long, and they’re just not very pleasant to look at. Enter the Foaster. It’s an iPhone charging dock that looks, well, like a toaster (if Apple designed kitchen appliances). With two slots for his and hers iPhones, it’s the perfect way to eliminate desktop clutter while keeping your phones juiced up. Foaster is currently seeking donations on the popular crowdfunding site Kickstarter. Creator Mike Charles is seeking to raise $40,000 to begin production of the stylish charging station. If funded, production will be done by various companies in Minnesota, Kentucky, and California. 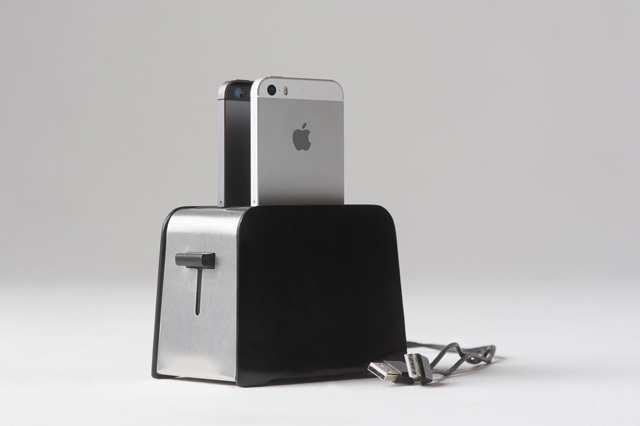 The Foaster’s design allows for two iPhones to be charged up simultaneously. A pair of USB cables connect the dock to a power source, while the excess cord can be stowed inside the unit for a neat, tidy appearance. The dock also includes two MFI-certified Lightning connectors for use with the iPhone 5. Contributions of any dollar amount are appreciated, but the minimum donation to get one for yourself is $79. That may come off as a little steep for a charging dock, but if you think of it as a piece of functioning art, it’s a bargain! This entry was posted in Apple, iPhone, Kickstarter and tagged foaster, iphone charger, iphone dock, Kickstarter, Lightning Cable, USB charger. Bookmark the permalink.